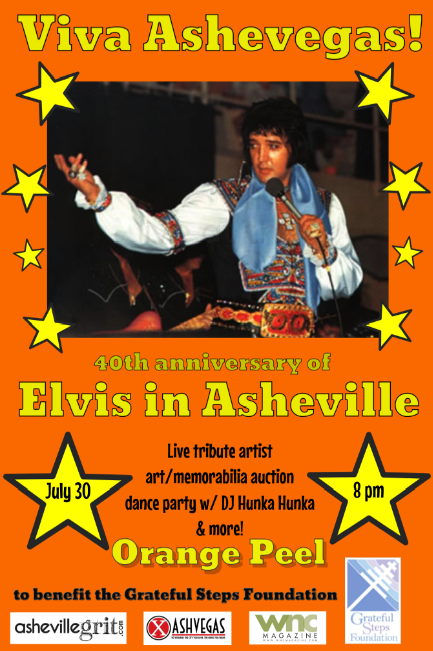 Jon Elliston, a local reporter, editor and Asheville history buff, has put together a great event at the Orange Peel on July 30 to mark the 40th anniversary of Elvis’ three-show run at the Asheville Civic Center. The event will include a presentation by Elliston, a performance by local Elvis tribute performer Carlo Martini and an Elvis-themed dance party. Tickets cost $12 ($15 the day of the show), with proceeds benefitting Grateful Steps, a local bookstore and book publishing house. Elliston has been enamored of local Elvis lore for years, after having published a story about the legendary entertainer’s exploits in Mountain Xpress in 2005. 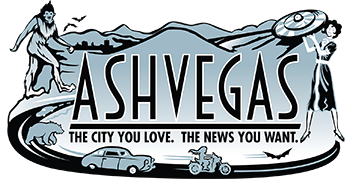 Elliston recently published an updated version of the Elvis-in-Asheville story in the latest issue of WNC Magazine. In the 40 years since Elvis took the Civic Center arena by storm, his legend has become a fixture of local lore, a source of loving wisecracks on the LaZoom tour bus and heartfelt memorials on Facebook forums. The saga of his Asheville escapades will always be composed of many stories—some of them true, some nearly so, and some indeterminate. What’s certain is that the Asheville shows found Elvis both sincere and flamboyant, both rooted and reeling—and, as was his wont, frequently armed. Staying at the Roadway Inn east of town, Elvis apparently got off two shots. The first was likely an accident: One afternoon in his hotel room, an emotional Elvis slung his arm around his father, Vernon, who was making a rare tour trip with his son. The embrace was cut short when a pistol in Elvis’ hand discharged, sending a round ricocheting before it bounced, spent and harmless, off the chest of Elvis’ on-the-road physician. Having dodged that bullet, Elvis wasn’t exactly chastened. Another afternoon, one of his bodyguards sheepishly approached the hotel manager, Charlene Noblett. “I’m sorry, but we owe you a television,” the bodyguard said, explaining that Elvis had put his foot through the TV screen during an impromptu wrestling match. A couple of years later, a member of Elvis’ crew copped to the truth. “Elvis shot the damn thing,” he said, evidently out of frustration with the set’s spotty vertical hold. At any rate, Elvis paid in full to replace the TV. Elliston’s production at the Orange Peel will pull more juicy highlights from Elvis’ time in Asheville. He’s also rounded up Carlo Martini, an Elvis impersonator who bills himself as “The Italian Elvis.” Martini has published a new memoir through Grateful Steps, Asheville’s nonprofit publisher with a Christian bent. 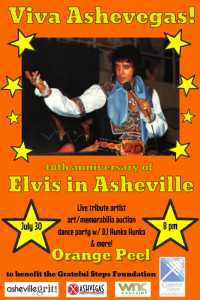 We propose July 30, 2015, as Elvis in Asheville Day. We suggest an announcement at the July 28 City Council meeting, and we’ll be there in person and in period attire to accept the proclamation, if it is granted. WHEREAS, Elvis touched our lives and the city’s history through his music and presence, which will be honored at a 40th anniversary event at the Orange Peel on July 30, a fundraiser for the nonprofit Grateful Steps Foundation. In the City of Asheville, to honor the city’s burning love for the King of Rock ‘n’ Roll.